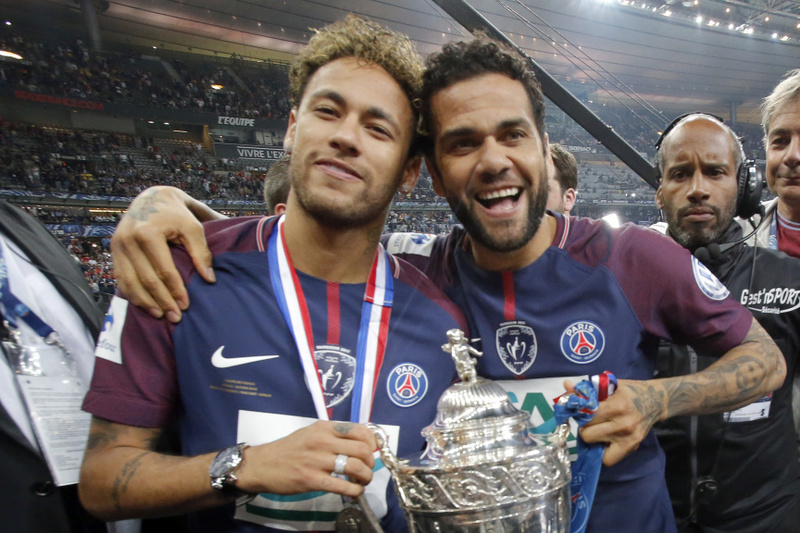 SAINT-DENIS, France (AP) — Moments before lifting the French Cup again, Paris Saint-Germain captain Thiago Silva beckoned the valiant skipper from beaten third division side Les Herbiers to join him. After a moment's hesitation, unheralded Sebastien Flochon shuffled across to the Brazil defender and they held the trophy aloft together. It was a fitting tribute to the resilience of the tiny club from western France following its 2-0 defeat against vastly superior opposition. The performance by the players of Les Herbiers — whose average annual salary of about 30,000 euros ($36,000) dwarfs the massive pay packets at PSG — was full of courage and spirited defending. It earned a guard of honor from PSG and a rousing ovation from the traveling, red-and-white clad fans of Les Herbiers. The club's coffers will also be significantly boosted, with the third division team earning 1.5 million euros ($1.8 million) — 75 percent of its annual budget. That's a drop in the ocean for PSG, which has an annual budget of more than 500 million euros. A fourth straight French Cup and League Cup double seemed assured. 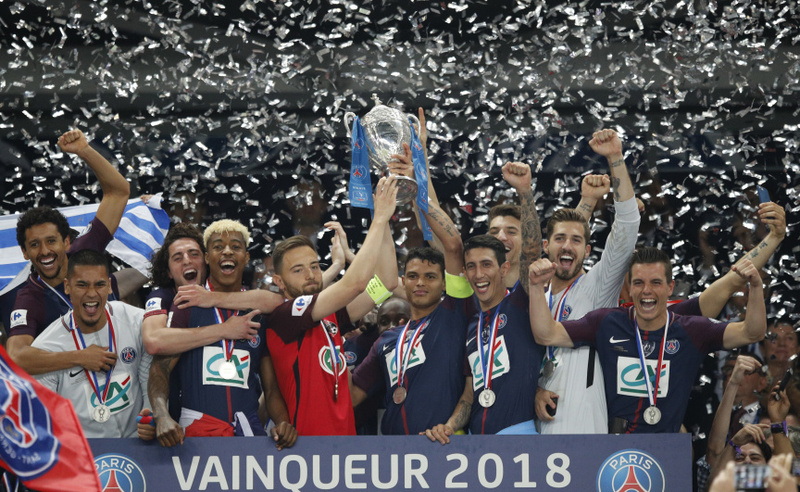 But while PSG secured a domestic treble, the team made hard work of seeing off Les Herbiers — whose population of 16,000 is five times less than the capacity of the Stade de France. PSG fielded its strongest side and went close several times before midfielder Giovani Lo Celso opened the scoring after 26 minutes. PSG then missed a succession of chances, and had a goal from Kylian Mbappe disallowed by the Video Assistant Referee system, before Edinson Cavani slotted in a penalty in the 74th minute. Roared on by its fans, Les Herbiers went close when substitute Clement Couturier raced through in injury time. PSG coach Unai Emery hugged his counterpart Stephane Masala after the final whistle, visibly impressed by the way his superbly-organized side had resisted so well. "I'm very proud of my players, my club, and my town," Masala said. "We held on and didn't get routed. At the end, we even almost scored." Masala's players continue their fight to avoid relegation to the fourth tier with a crucial match on Friday. PSG won a record-extending 12th French Cup and claimed a 42nd straight victory in domestic cup competitions since Jan. 2014. While PSG's stars head to the World Cup in Russia in June, this is likely to remain the biggest game of their lives for Les Herbiers. Before kickoff the team met French President Emmanuel Macron, who said "enjoy yourself" as he shook the hand of each player. Masala told Macron "you're a source of inspiration for me," referring to his improbable rise to the presidency last year. Les Herbiers had the first shot in the first minute, deflected by a defender for a corner. It was all PSG after that. Lo Celso and Mbappe hit the post, winger Angel Di Maria headed over and Lo Celso struck the woodwork again, all inside 20 minutes. Then, Lo Celso picked his spot from 22 meters (yards) with a curling strike into the bottom left corner. Cavani was denied by goalkeeper Matthieu Pichot and, moments later, Mbappe bundled the ball in from close range but referee Mikael Lesage used the VAR and ruled it out because Brazil defender Marquinhos had handled. 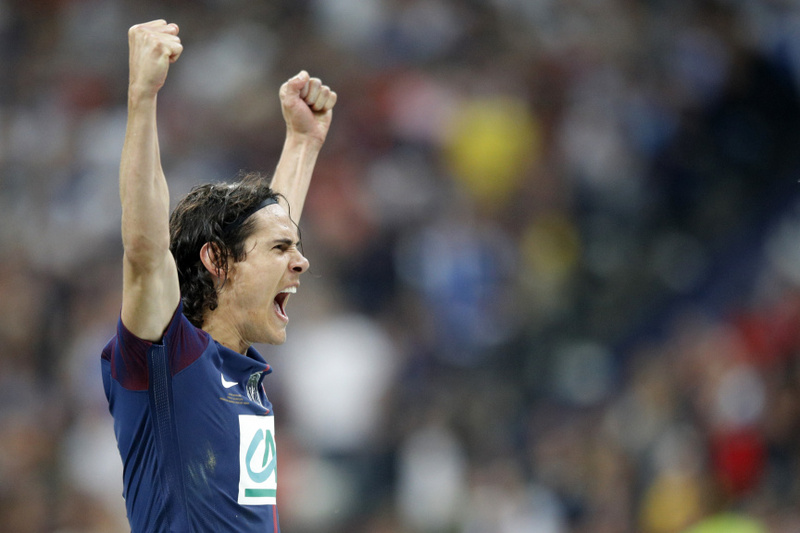 Cavani was then brilliantly thwarted again from close range by Pichot as chances kept coming. Mbappe, twice, and Cavani miscued again before the Uruguay striker drilled his spot-kick into the bottom corner after being upended by Pichot. Lesage could have sent Pichot off but only showed him a yellow card and the goalkeeper tapped the referee's hand in appreciation. It was a quiet night for PSG goalie Kevin Trapp, who remarkably did not touch the ball until the 54th minute. "They fought very well and played good football, too," Trapp said. "Honestly, it was tough. We had a lot of chances and some bad luck."